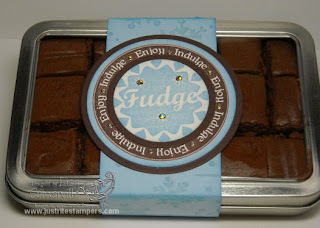 I bet you're all wondering how in the world I was able to make a batch of fudge, create the project, and not have my family eat it before I could finish! Well...I told them I needed it for a project, and they'd be able to eat it next month! Boy that didn't go over very well, but I was able to sneak a small portion to share with you for today's project. Although you cannot see it in the photograph - my Bashful Blue strip of card stock was stamped using the Bold Snowflakes Wheel and the Faux Dry Emboss Technique. My strip of card stock measures 2" x 11", scored at 3-1/16, 4-1/16, 7-5/8, 8-5/8, wrapped around the back and adhered with snail. For my tag, I used my JustRite Stampers Baking Ensemble and my Wooden Stamper - Harmony Classic Circle II, I stamped the "fudge" in Bashful Blue on White card stock, cut it with my Circle Nesties, edged it in Bashful Blue Ink, then layered it on a piece of Chocolate Chip that was cut with my Nesties. The words from the set are stamped in Chocolate Chip on White card stock, cut with Nesties, edged in chocolate chip, then layered on a pieces of Bashful Blue and Chocolate Chip that I previously cut with my Nesties. I added some "bling" diamond stickers to dress up my tag and adhered it to my tin. Be sure to stop by Pat's blog to see her post for today and the links for the other TJNL DT players.